When Beech-Nut asked me to take some of my favorite organic pouch blends and recreate them in my kitchen, I was thrilled! 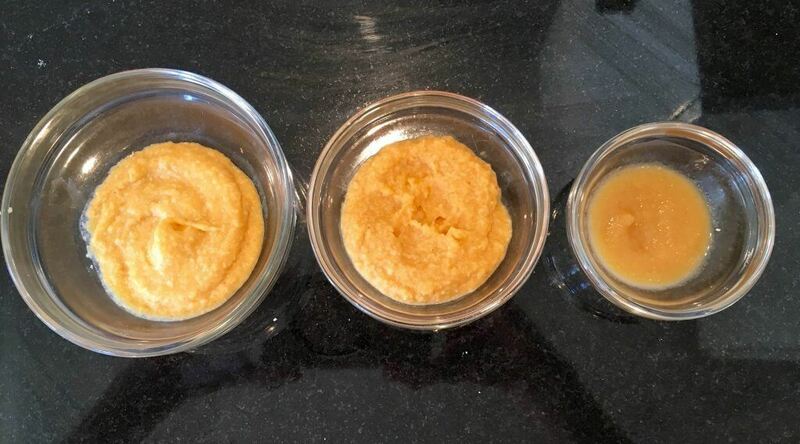 As a registered dietitian and pediatric nutritionist I love teaching parents how to make simple baby food from scratch. And, now that my own baby is just a few weeks away from starting solids, I am gathering exciting recipes to make for her! I will be taking great care as a mom to make sure she’s getting the flavors, textures and nutrients she needs. 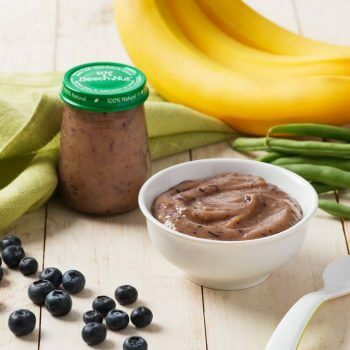 I know that time will not always allow homemade foods, so I love that I can look to Beech-Nut to provide not only high-quality store-bought baby food, but also some unique flavor combinations that I can recreate at home for when I do have the time. 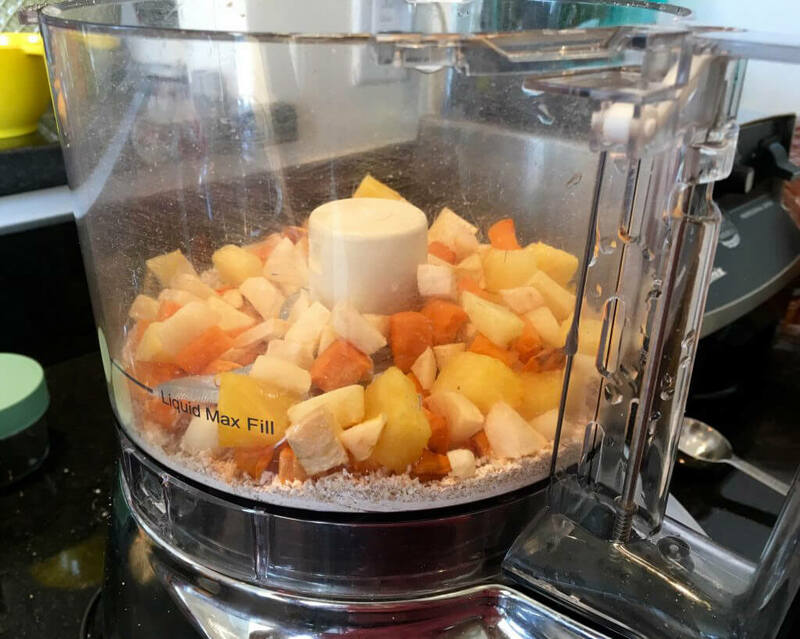 I decided to start with apple, sweet potato, pineapple & oat. For starters, Fall is approaching, so apples are on my mind. 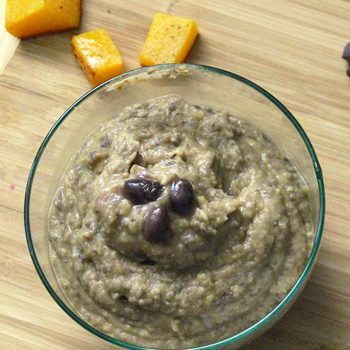 Plus, I love using oats in baby food because it’s high in heart- and gut-healthy fiber. The pouches have oat flour, which can be harder to find in stores, so I’m going to show you how to easily make your own using old-fashioned oats. 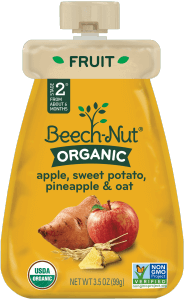 Looking at the Beech-Nut organic pouch, the ingredients read: Organic Apples, Organic Sweet Potatoes, Organic Pineapple, Water, Organic Whole Oat Flour. Ingredients are listed on labels in order from most to least used in the product. So, I adapted this order when making this blend at home using the most apple followed by sweet potato, pineapple, and finally oats. I made this blend using my top two cooking methods – steaming and roasting. Steaming is fast, and retains most of the vitamins and minerals. Roasting takes double the time, but I find the blends more flavorful because roasting brings out the naturally occurring sugars in fruits and vegetables. Additionally, roasting also yields a thicker puree that requires extra water to thin out. Beech-Nut has labeled this variety as a stage 2 food, which is generally recommended for little ones around 6 months in age. As always, trust your instincts and you can always consult your pediatrician before starting a new stage of food. Add water to a medium pot (I used 12 cups of water for an 8-quart pot) with steamer basket or tray. Cover with lid and bring to a boil. 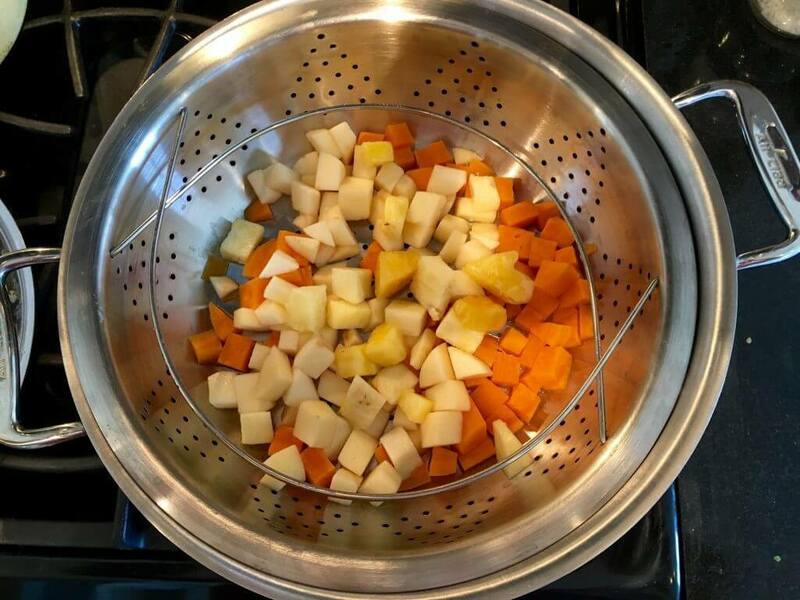 Once water is boiling, add sweet potatoes to steamer basket, cover with lid and steam for 8 minutes. Add apples and pineapple steaming for additional 6 minutes until soft and easily mashable with fork. 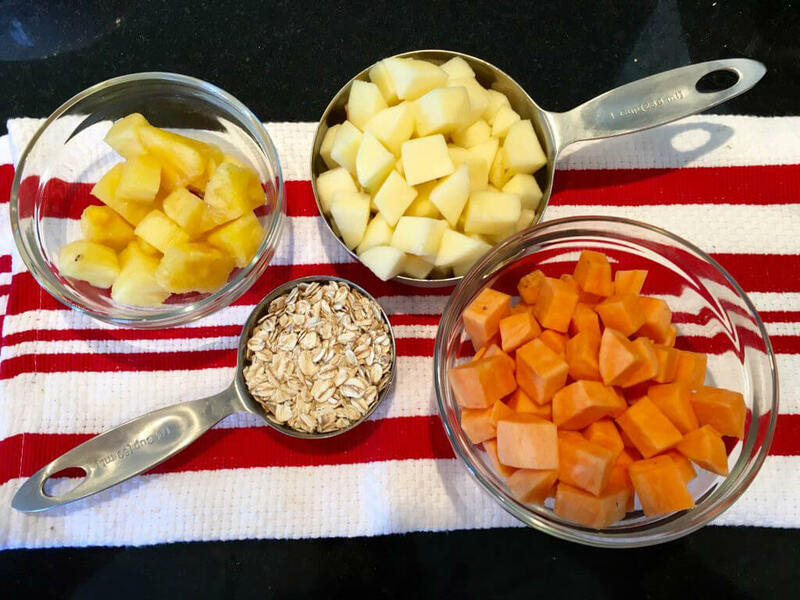 While fruit and potatoes are steaming, add oats to food processor or good blender. Turn on high for 1-2 minutes until ground into a flour-like consistency. Keep oat flour in food processor or blender. 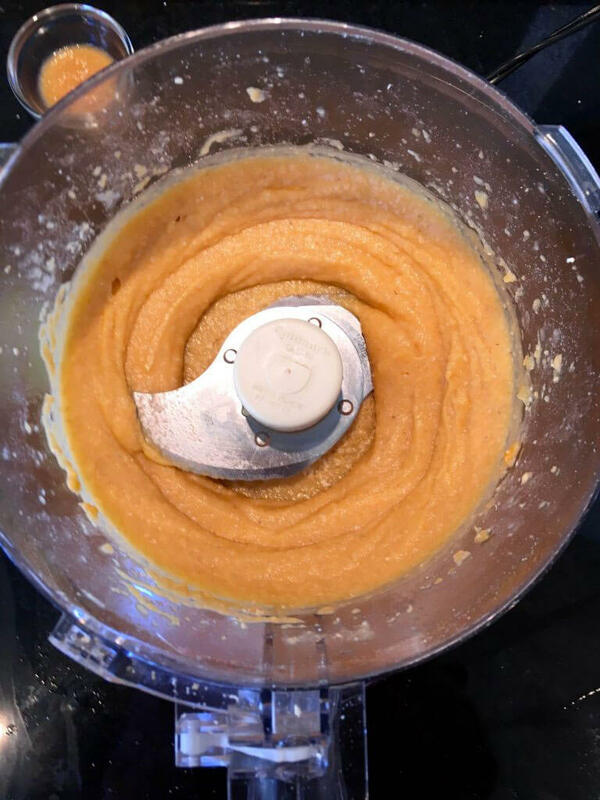 Add steamed fruit and potatoes into food processor or blender along with oat flour. Blend until smooth, or desired consistency is reached. For thinner texture, add 1-2 tablespoons of cooking water. Line baking sheet with parchment paper for easy clean up and to prevent sticking. 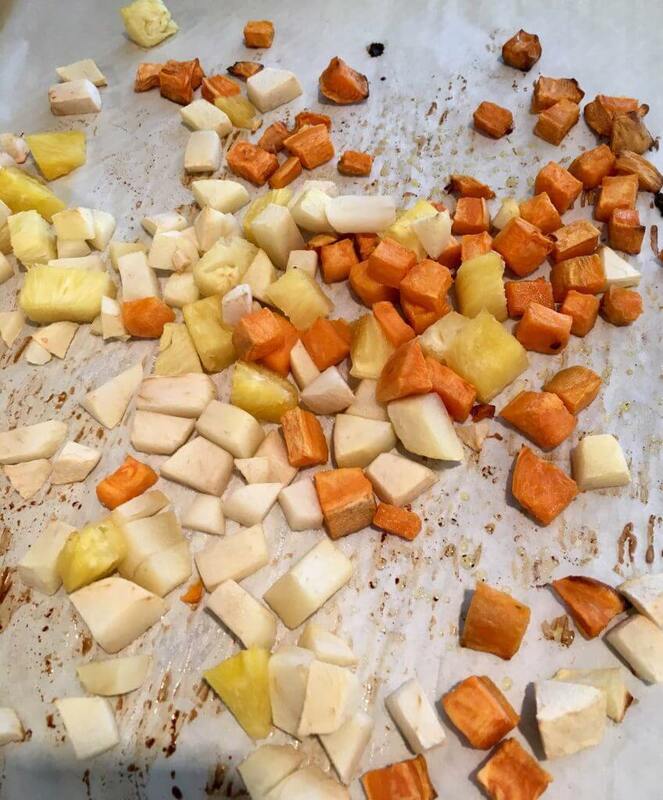 Place sweet potatoes on baking sheet and drizzle with olive oil. Place in oven for 15 minutes. Add apples and pineapple to baking sheet. Cook for additional 20 minutes, mixing once halfway through for even cooking. 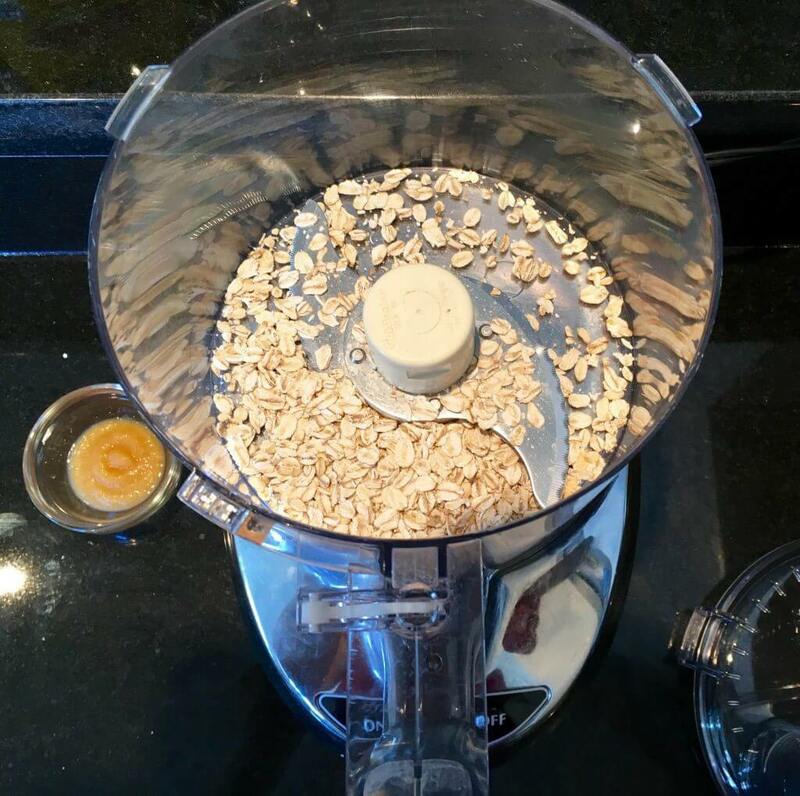 While fruit and potatoes are roasting, add oats to food processor or good blender. Turn on high for 1-2 minutes until ground into a flour-like consistency. Keep oat flour in the food processor or blender. Remove fruit and potato mixture from oven and allow to cool. Add to food processor or blender along with the oat flour and 1/4 cup water. Blend until smooth, or desired consistency is reached. For thinner texture, add additional water. Feel Free to double or even triple the recipe to freeze for future use. *When deciding whether to go organic or conventional I defer to my most trusted resource – the Environmental Working Group (EWG) Dirty Dozen and Clean Fifteen lists (link: https://www.ewg.org/foodnews/clean_fifteen_list.php), which breakdown what produce to splurge on organic based on the amount of detectible pesticide levels. But, if you don’t have the list handy, my general suggestion is to choose organic, if you can, with produce that has thin skin and/or grows close to the ground, like berries, apples, and potatoes, and to go conventional with fruits and veggies that have thicker peels, like pineapple and bananas.